Bovada has become the most recognizable US brand in online betting since their launch in December 2011. When big sports media companies like ESPN, CBS or the Wall Street Journal quote betting odds or Super Bowl props, it’s usually Bovada supplying the data and lines. Customers in the United States and independent observers alike have rated Bovada as one of the top sportsbooks in the business. When it comes to betting on the Super Bowl, you can count on Bovada to have the best odds, props and live betting to get you through Super Bowl Sunday. Bovada boasts a clean, easy to navigate website layout, which features their sportsbook, the online casino, or the racebook. All promotions and bonuses are prominently displayed including their First Deposit Bonus. Bovada will give you a free bet of up to 50 per cent of your initial deposit, up to $250. Signing up for Bovada is a breeze. You simply enter in your personal information, create a password, and you can start depositing funds into your Bovada account. You must validate your identity at some point, but usually not right away. Bovada is especially proud of its industry-leading customer service. And when we say ‘industry-leading,’ its not even really close. English-speaking staff are available 24/7 to help you with any issues you have, either by phone or online. Their FAQ section is pretty thorough so be sure to check that out before you contact the customer service representatives, you may find the answer much quicker! There’s no shortage of betting lines available at Bovada. On Super Bowl Sunday, you will find more prop bets here than anywhere else on the web. In addition to the Super Bowl and every NFL regular-season and playoff game, you can bet on a wide range of sports from across the globe. Everything from basketball to UFC to darts is available. You can even bet on entertainment props like who will win Dancing with the Stars. Their Super Bowl odds are pretty thorough, they really think of everything. 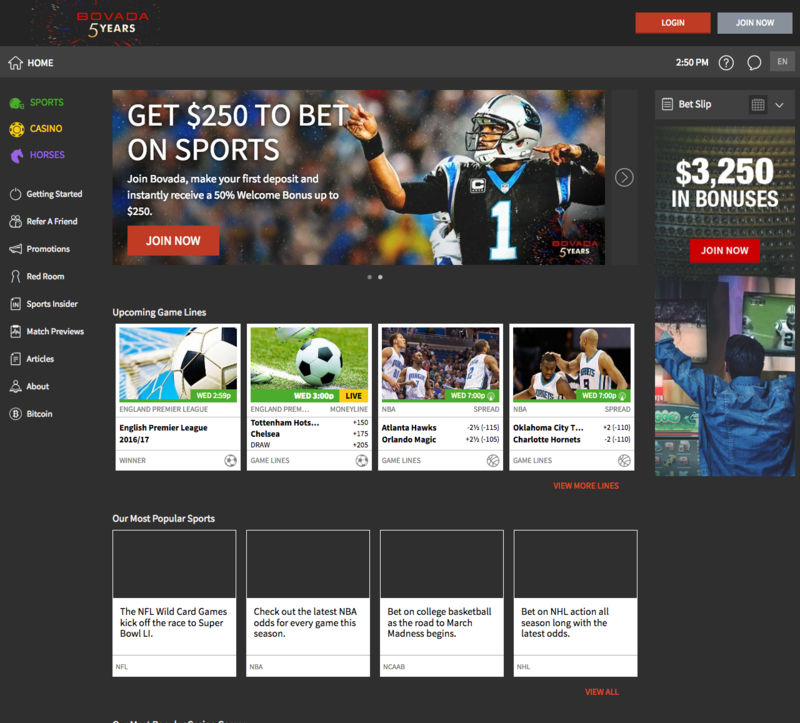 Their props and live betting sections have outlandish options that could make you some big money if you bet correctly. Their live betting structure is easy to use and you can use the ‘quick bet’ option to make sure you get your bets in before the play expires and the odds change. Some bets you may find for the Super Bowl include anything from the coin toss to the color of Gatorade dumped on the winning coach. What are Bovada’s deposit and payout options? Bovada boasts popular deposit options, including Bitcoin, Visa and Mastercard. You are able to use prepaid credit cards. They have embraced crypto-currency and Bitcoin often provides the quickest and easiest payment method, with the smallest fees as well. How is Bovada’s mobile betting platform? If you’re betting from the sports bar, or from home, you can use your Bovada account from just about anywhere. Bovada offers an easy to use mobile betting site with no download required. You can access it at bovada.lv/mobile and log in using your user name and password. The site is fully compatible with both iPhone and Android devices. You can make a deposit to your account and place any bet available through both the mobile and the “regular” online site. This includes lines and futures on all majors sports including the NFL. Expect web traffic to be crazy on Super Bowl Sunday, so it really pays to have everything set up, your deposits made and your bets ready in the days before. Does Bovada offer good live betting? You can bet on the Super Bowl live through Bovada’s live betting structure. The odds are dynamic and change constantly based on the game plan and the bets being placed by the masses. When using Bovada live, the minimum bet is $1, while the maximum bet is $100. Placing a bet is easy. Simply click on the LIVE icon next to the game to launch the Bovada Live bets for that game. Select your wager amount and click the bet you want to place and you’re done. Now just wait for the play or at bat and hopefully collect your winnings.